>One of the persons I want to meet in person one day on this side of heaven, is my dear friend Trisha Poff who blogs at A Multitude of Mercies. I am grateful for her life and for the providence of God who has brought us together in such a special way. Thank you, my dear friend for writing such a timely and important article for all the women in the kitchen. We don’t want to leave our children out of the kitchen, do we? It’s important as mothers to be nourishing our children’s souls with sound doctrine as diligently as we nourish their bodies with good food. Our husbands are the spiritual leaders of our homes, and yet, we have the wonderful privilege to speak His truths to our children all day long. But what does this look like, especially as we mother our Littles? This season of parenting is known for it’s unpredictability as we try to keep up with the laundry and dirty dishes, preserve our sense of humor, and not fall asleep while having a conversation with our husbands or while sitting in church. While I’m sharing some practical ways to teach your children doctrine throughout the day, please note it comes with a HUGE caveat. The best way you can teach your children His truths is to live them out yourself right before their very eyes. Words that come from the mouth of a heart that’s not surrendered to the Word of God will fashion hypocrites and Pharisees. God help us to make sure the walk lines up with the talk. Let us not, by God’s grace, be stumbling blocks to these precious souls God has entrusted to our care. And in the midst of all the practical application, faithfully remind your children that is it not right doctrine that saves us, but the very blood of Jesus Christ. Remind them that we are righteous because of His righteousness. That said, here are just a few things I’ve learned in the 16 years I’ve been a mommy. 2) Be enthusiastic. Ask your children to tell you what they think you’re passionate about. Is it cooking? Reading? Sewing? Should not our passion for His truths be just as strong? How is your voice when you’re reading the Bible? Do you share your tears with them when you’re overwhelmed by God’s goodness? Do you communicate that being in the Word is just another thing to do before getting to the “good stuff”? 3) Teach the catechism. What a wonderful tool this is for planting sound doctrine in the hearts and minds of our children. The word catechism simply means “question and answer.” Who made you? God made me. Our family starts with the Children’s catechism, and then moves to the Heidelberg around age 8. 4) Memorize Scripture. Teach your children early to hide the very word of God in their hearts. I use the My ABC Bible Verses by Susan Hunt in the early years, and then we memorize chapters of Scripture at a time. 5) Remember the power of music. Songs stay with us. How many of us have songs that we learned years ago still floating around in our memories? Learn hymns. What a rich treasury most of them are of truths founded on God’s Word. Listen to music by artists like Judy Rogers or Dana Dirkson as well as the Hide ’em In Your Heart CDs by Steve Green. All of these are full of sound doctrine. 6) Share how sound doctrine has affected your life. Our children love to hear us talk about ourselves, don’t they? When I tell my children I used to read Benny Hinn’s books or share other follies, I let them know the price of ignorance. False doctrine is an invitation to sin, and our own errors should make us that much more passionate about teaching our children well. 7) Make Scripture your standard. From the beginning, the question should be, “What does God’s Word say.” Measure your life by His truths and your children will learn to do the same. 8) Role play. Challenge your children with hypothetical situations and ask them to defend their response from Scripture. 9) Have your children keep a doctrine notebook. This idea is from Sonya Shafer. As your children come across Scriptures that teach certain doctrines, such as election, justification, sanctification, etc., have them note the Scriptures in their notebook. 10) Redeem the moments for His glory. When you see the butterfly, talk about how God made everything and how He makes us new creations in Christ. When you’re changing a diaper, recite the first questions of the catechism, sing a hymn, or quote Scripture. (Yes, I do this!) When you’re brushing hair, remind your child that the very hairs on our heads are numbered by God. 11) Pray for wisdom to speak His truths naturally and intentionally to your children, and pray that all in your family would have strong spiritual instincts that are sensitive to doctrinal error. 12) Remember God’s grace and the work of the Holy Spirit. If you haven’t been teaching your children sound doctrine, don’t despair! Start today. And if you have been faithfully imparting God’s truth to your children, guard against pride, remembering that it is all by His grace, and that we cannot do the work of the Holy Spirit in our children. 13) Remember the basics. Have you taught your children the names of the books of the Bible? The Ten Commandments? Psalm 23? The Nicene Creed? Sometimes it’s easy to focus on big accomplishments while rearing Biblically-illiterate children. 14) Don’t forget the Church. Model to your children the importance of being part of and accountable to a local church body. Teach them what a gift it is to be under sound teaching each week and part of a community of believers. God bless you as you faithfully teach your children sound doctrine! This entry was posted in Doctrines_In_The_Kitchen, Guests by Becky Pliego. Bookmark the permalink. I have been waiting to purchase a Judy Rogers cd (we love Steve Green's music) and I also use some of doorposts child/character training charts — it would be such a blessing to win. >As a new mom who was raised in a home where the emphasis was on the outward appearance, thank you for your words of wisdom. I feel so overwhelmed at times. Being a good godly parent is a daunting task. >I just found your blog yesterday. It has already been such an encouragement! >As a homeschooling mom of four, it is always nice to hear ideas and strategies for teaching. We're working on the 10 Commandments right now. I'm going to be checking out the Doorposts website for some teaching aids because I haven't really found anything I like for Bible-based teaching aids. Thanks for the post! >I've just found your blog– thanks for the great encouragement and simple reminders of how to nurture our faith and our kids! >This is so helpful Trisha…thank you! I especially love #10.I'm asking Him to help me see those teachable moments (to not miss them or be too hurried to pause and take the time needed).Just that everyday times that show evidence of who He is. >Thankyou, Trisha, for the wonderful ideas in this post.God bless you! >Thank you, everyone, for such kind words. You've blessed my heart.How wonderful is the grace of God in our lives! >Trisha – love this post! So many practical ideas. I relate so well to point 2 about sharing your tears with your child when you're overwhelmed by God's goodness. Thank you for saying this is showing enthusiasm for Him, I won't be so embarrassed next time that happens! Bless you. >Oh, Trisha, what a wonderful and encouraging post! May God bless the Truth- and Gospel-centered love you're pouring out into those precious lives He has entrusted you with! Love and hugs! >Thanks for the encouragement Trisha! My kids and I have had a lot of fun practicing the catechism. We use Susan Hunt's book "Big Truths for Little Kids" and make up songs for the memory verses. Even my two-year-old answers the easy questions. But there are times when days with five kids eight and under are long and hard, and I grow weary. In those moments, it is more important than ever to drink deeply of the Word that God might fill me so that I can overflow into my children and others. Thanks so much for the encouragement! >wow I wish I would have read this 23 years ago. I have been walking with the Lord for 21 years. It would have been nice to have started out with this post. However, God is faithful and has led me to sound doctrine in my church and in places like this. As you have said, the sound doctrine does not save you, however, Jesus is the truth the way and the life, and if you are not walking by the truth, you have a false Jesus. Truth is what transforms your life. Something that I am most grateful for! >I pray that one day I have this wisdom! 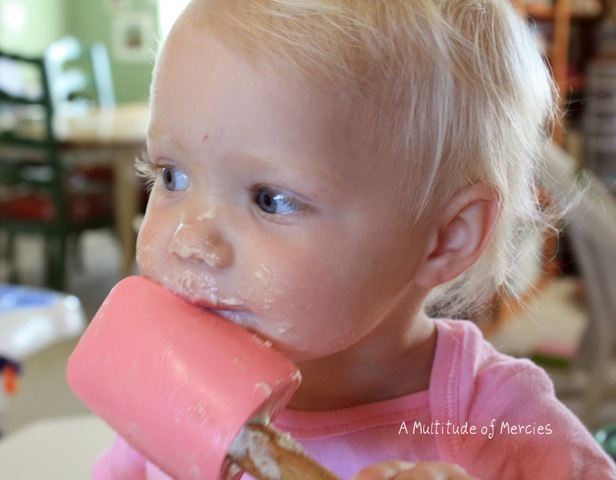 This is a great post and I could possibly comment on each section…but I'll spare you!I was moved to tears (bear with me…I just had a baby) thinking about catechizing my little infant as I changed her diaper…and combing my littles hair speaking of God's glorious knowledge!This posts speaks to me of mothers who have God flowing through their souls in everything they do…how I long to be there and in the presence of God all through my day.Praise God for women like Becky and Trisha who encourage us to turn to Him in our every need. >I need to remember all of this sage advice! >Great advice,I especially like it when you mentioned that we should repent when we sin against our children. That is something I need to do more. >Such practical advice-one to be printed out, reread and acted on.Thank you. >Trisha, I can't even begin to tell you what a blessing this post was for me. I would have loved to have read this 36 years ago when I began my journey as a new Christian mom. In some ways it makes me sad, because one of my adult lambs has with full understanding, strayed into terminal doctrinal error and I can't help but wonder if my failings in some of the areas that you mentioned here may be partly to blame. And yet, I still know that God is Sovereign over election and also that it isn't over just yet. I laughed about loading the kids into the car post non-payment of grocery items. Been there too – and believe me, those lessons do make a fine impression on our children. I am printing this off and handing it out to our women at our next women's meeting. God bless you and your Littles! >Great post, Trisha! Your encouragements aren't just applicable to a mom with young ones but to this mom with a teen. I appreciate that your list is practical and steeped in the Gospel.May we be encouraged to nourish our children in this way! >This is wonderful Trisha-your children will rise up and call you blessed-I am sure eternity alone will tell how many young mother's you have mentored through your blog! >Trisha, you never stop amazing me or blessing me. I am so thankful for you — for your wisdom, for your grace. I pray that this article is widely read and encourages many momma's! I love the whole article and you are so darn quotable but I loved this in particular: "The best way you can teach your children His truths is to live them out yourself right before their very eyes. "May God write His laws on our hearts! Love you dearly! >Thank you for the great practical advice! As a mom of three little ones, I always appreciate encouragement to persevere in training them in the ways of the Lord.